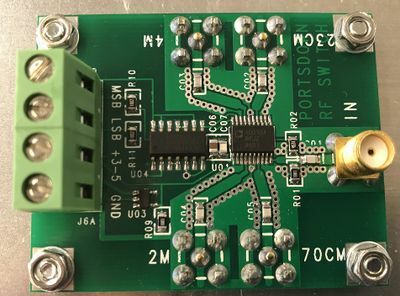 The Portsdown team have developed an RF output switch capable of switching the low level output of the Portsdown filter modulator board to separate amplifiers for the 70, 144, 437 and 1255 MHz bands. Note: due to potential high insertion loss, it is not recommended to use the switch above 23cms. The Schematic and parts list with Farnel and Digikey part numbers are available for download. The data sheet for the Analogue Devices RF switch IC used on the board is available here. This page was last modified on 21 June 2017, at 21:28.